Three elite heavyweights, three underwhelming fight announcements. Boxing's late 2018 momentum has vanished and what appeared a riveting heavyweight scene now resembles a "disaster", according to the BBC Radio 5 Live boxing team. Tyson Fury and WBC world heavyweight champion Deontay Wilder promised a rematch, only for an encounter to not only be put on hold but perhaps be delayed for a full calendar year. Anthony Joshua cancelled a much-hyped booking of Wembley Stadium in April and now defends his IBF, WBO and WBA titles in New York against Jarrell Miller on 1 June. In a four-week period from 18 May - when Wilder faces Dominic Breazeale - to 15 June - when Fury takes on Germany's Tom Schwarz - all three elite heavyweights will fight in matches few fans, if any at all, called for. Just what on earth is happening? Tyson Fury was last to name his opponent and there is no doubt his move to join forces with broadcaster ESPN in the US in February critically complicated matters as all three men now work with different American networks, making negotiations between them far more complex. BBC Sport boxing commentator Mike Costello: We turned into the year that we hoped would be the year of the heavyweights. They have dominated discussions but not for the right reasons. Judging by the response online to the announcements, fans feel it's a disaster. But as a professional boxer you have to earn the most amount of money while taking the least amount of risk and that is what they are doing. With each of these announcements we lament that the great era we forecast may not happen. BBC Radio 5 live boxing analyst Steve Bunce: Joshua, Wilder and Fury are with different broadcasters, different promoters and have different agendas. I have to say, it is a heavyweight disaster. The big three are not going to fight one another this year, let's get that stated now. You may have heard some promoters and TV executives talking boldly, bravely and saying 'yes it can still happen'. No, they will not fight one another this year. Excitement peaked in the glamour division in the hours and days that followed Fury's enthralling draw with Wilder in Los Angeles. Both men spoke of a rematch, as did the WBC, only for delay to set in before Fury's ESPN move ultimately told fans to shelve plans for Wilder-Fury II. Costello: We are hearing from Bob Arum - the legendary Top Rank promoter who works with ESPN on behalf of Fury - that there will be another Fury fight later this year that will not involve Wilder, another showcase fight. Arum is saying if Wilder v Fury happens again, it's in the early stages of next year. Arum doesn't get a lot wrong. I just wonder what is in his thinking. We are told he has a five-fight deal with Fury and I just get the sense Arum has got it right so often in the past that maybe we have to let them have the space to build him in the States. Bunce: I'm not a gambling man but I'd have 5p or a coffee with you that Fury and Wilder don't fight by May of next year. It is, as I say, a heavyweight disaster. 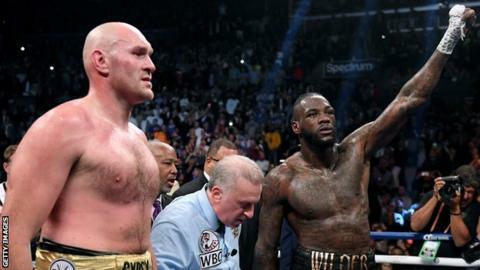 In December after their draw, Wilder and Fury had that rare thing in this sport - some moral high ground, knowing they would give us a rematch for what had thrilled us. That first match reconverted the US public to the heavyweights, as they had not been bothered for 20 years. Suddenly the public bought into it. If the rematch had been in April or May I am convinced it would have changed the boxing landscape. I'm convinced. Costello believes Joshua has the harder of the three tasks before him, with Fury's unbeaten opponent the weakest of the three men seeking a colossal upset. Costello: I think there was particular disappointment in the Fury opponent. The German is unbeaten in 24 fights but has little to recommend him at the highest level. The difficulty with Schwarz may be that Fury's best displays at the highest level have been when he has had fighters coming on to him. I have watched Schwarz in action and sometimes he looks like he is in slow motion. So Fury will have no problem reading him. Bunce: Schwarz being unbeaten ticks a box, he has a six pack, that's good. But he's out of his depth. The only reason he might work is that I have a feeling that Fury may fancy trying to get on top of him, finish it quick and excite the millions watching and the thousands travelling out. He owes it to the fans. He has spoken a great fight since he lost the weight. Now people love him and he's the peoples champion. Part of that comes from the Wilder display and part comes from a year of flawless PR. He has put a foot wrong with this opponent. Does he owe the public? No. But he has to perform for them. For that reason, Schwarz may be ideal. The Brits can flood the Las Vegas bars and have a great time.